Glasgow, its housing schemes and wealthy suburbs, the tramp in the bus station, the Somali refugee struggling to find a home among strangers. 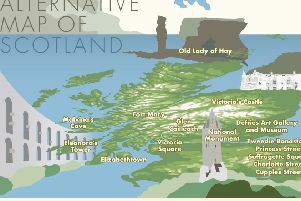 And Argyll, with its standing stones and villages where the neighbours know if you sneeze. Both locations are settings for Karen Campbell’s books and loom every bit as large as her characters and plot. In fact, Campbell couldn’t have written these books about anywhere else. A former police officer, who later returned to Glasgow University to do a Creative Writing Masters, her home city of Glasgow and a more recent rural address give her novels a sense of place that permeates every page. Along with place, she writes of escape and belonging, identity and nationhood. Campbell’s experience as a bobby on the beat gave rise to her crime books, Twilight Time, After the Fire, Shadowplay and Proof of Life, published between 2009 and 2012, and won her a Best New Scottish Writer Award in 2009. She also reflected on the refugee experience in Scotland, in last year’s This is Where I am, which was a BBC Radio 4 Book at Bedtime. Now Campbell has gone beyond the city to explore new territory in her latest novel, Rise. Set in a mythical Highland village called Kilmacarra, it was actually inspired by the real village of Kilmartin in Argyll and Bute and coincided with her relocation from Glasgow to Galloway. If place is important, so is time and the novel has a distinctly contemporary feel with a backdrop of the Referendum on Scottish independence and the sustainable energy debate raging as the plot unfolds. “I had written a fair chunk of the book before we moved out here so it’s not about where I actually live now,” says Campbell. “What inspired it really was Kilmartin Glen where I had been on holiday with my family in 2000. We were exploring at Inveraray and discovered Kilmartin. It’s a hidden gem and peppered with standing stones. I found it fascinating and took a lot of notes with a view to writing a story on it, but had no idea for it, no character or plot, and put them away for eight or nine years. Then the idea for the story came and I thought it would work in a small place like that. “I changed the name because I found it a bit restrictive. I wanted to make the geography a bit different and not rooted in one place. You want authenticity, facts, but changing things a bit frees you up to make the place serve the story rather than the story fitting a pre-existing place. It also means you don’t have to worry about things like the actual bus timetables,” she says. Campbell’s move was prompted by her children leaving home and her desire, with her husband, to explore a country lifestyle, but Rise is peopled by characters with more pressing reasons to search out a rural idyll. There is Justine, who is running for her life from her drug dealer boyfriend and washes up in the home of Michael and Hannah, who are also searching for a new start, while their marriage and family disintegrate around them. Written in the run-up to the Referendum, Campbell embraced the theme of separation and union on both a personal and political level in Rise, anchoring it very much in the here and now of Scottish politics. Campbell voted Yes, but wanted the book to reflect the differences of opinion and points of view of her family and friends and the country as a whole. While Scotland tried to work out whether it wanted a divorce, Campbell’s characters have their own marital breakdown to cope with. Rise is a book about vision, and also literally about visions, as Campbell shines a light on schizophrenia and mental illness. Michael, one of the main characters, might be a preacher, but the last thing he expects to see is ghosts or angels in his church or manse when the stress of his life overwhelms him. Observing others in crisis was an everyday occurrence for Campbell in her days as a policewoman in Glasgow, when she got to see behind the closed doors of the city where she grew up. “You see people at their worst and best. It was the city I had always known but it was as if someone had lifted the rug to show what was underneath. You are digging away at the archaeology of a city and seeing under the layers,” she says. Campbell’s parents were both police officers and, newly graduated without a clear idea of a career path in her head, she decided to follow them into the force. “People’s perceptions of you change when you put on a uniform,” she says. “Inside you’re still a daft lassie that was up the dancing last week but this week you’re in charge of Glasgow city centre. People make assumptions about you and expect you to take charge. When Campbell had her first daughter, there was no part time position or job share available and she gave up policing, going back to work later as a council PR officer. “Nothing shocks me now about how people will behave. Policing taught me great observational skills and you are privileged when you see people in very private spaces,” she says. If Campbell experienced a shift in perceptions of her identity as soon as she put on a uniform, the Somali refugees she writes about in This Is Where I am Now were similarly assessed. “People make assumptions about who you are and where you come from. Words like migrant or refugee have negative connotations and people assume you’re illegal. They judge you but they’re not seeing the real you,” she says. Campbell didn’t want to make the same mistake and spent a lot of time finding out about the asylum seekers’ experience. Campbell is about to leave Scotland behind for the location of her next novel after a holiday in the Italian Apennines sparked her interest. Funded by a Creative Scotland Artists bursary, she plans to research the Buffalo Soldiers who fought there during the Second World War. “They were the only unit of black US troops to see service and it’s set in the Sesia Valley where they fought. I didn’t know anything about the history so it’s a huge amount of research. Most books I start with the story and research as I go along, but with this, I need to really write myself into the period. It will take me over a year to get it all together,” she says. And no doubt a trip or two to Italy to really get that sense of time and place.